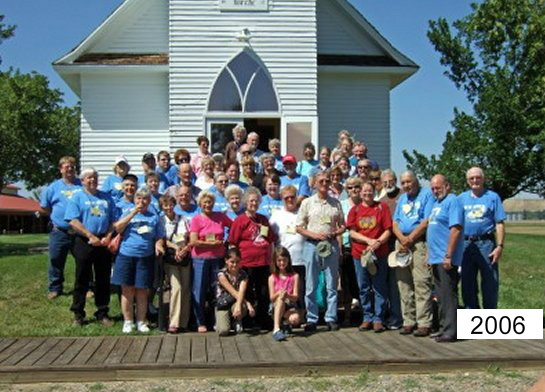 The Boggess Family Association reunion held in 2006 was hosted by Howard Boggess and Sandi Choate July 20th through July 22nd in Billings, Montana. The reunion was held in conjunction with the Celebration at Pompey’s Pillar National Monument; Lewis and Clark stopped there on the return trip to St. Louis. On Thursday the 20th most of the Boggess descendents that were attending the reunion checked into the Ramada Motel. Thursday evening Howard and Sandi hosted a dinner in the backyard of their home in Billings. Now you must know that Howard is part Crow Indian and the dinner reflected that. We feasted on beef and buffalo. A couple of Howard’s many friends cooked the meat and the wonderful country pies. The buffet style dinner was also comprised of many salads and side dishes. After the crowd of about 100 people had eaten, Howard treated us to some of his noted storytelling. We learned about Howard’s Boggess background and his early days on the reservation and his love of Montana. One of Howard’s many interests are the Indian pictographs (prehistoric Indian drawings) found in the Billings area. He and his friend have researched the early drawings and photographed the art. Before the reunion, Howard and his friend gathered many local rocks of all sizes. Sandi painted signs on the rocks taken from the photos and presented them to us as a gift after the dinner. Betty West brought the reunion t-shirts and pins which were eagerly purchased by the descendents. The shirts were medium blue and white as can be seen in the photo above. On Friday there was a bus ride through the Crow Indian reservation which was narrated by Howard. The first stop was at the Chief Plenty Coups State Park. The only museum of the Crow culture is on the grounds where the last home of Chief Plenty Coups still stands. Plenty Coups was the last traditional tribal Chief of the Crow people. We ate lunch at the Custer Battlefield Trading Post and Cafe across the road from the Little Bighorn Battlefield. Most of us took the opportunity to enjoy an Indian taco which consists of Indian fry bread topped with the usual taco ingredients. Yummy. Then another stop at the Big Horn County museum near Hardin. The complex contains old preserved buildings such as a school, church, depot, doctor’s office, machine shop, working farm buildings just to name a few. Saturday was our free day and many of the descendents returned to the Little Bighorn Battlefield while others attended the celebration at Pompey’s Pillar. Others remained at the motel to spend time at the hospitality room which was generously provided by Jess and Barbara McKinney. In the evening we attended the banquet at the Billings Hotel and Convention Center where once again we had the opportunity to taste roasted buffalo. After the banquet we went back to the hospitality room for the annual gift exchange. Then a meeting was held to discuss the next reunion. The attendees voted to hold the next reunion in West Virginia. The reunion had officially ended but Sunday morning most descendents chose to meet for breakfast at the Golden Coral. It was one last chance to be together. Many descendents soon left for the airport to return home but many loaded their cars headed for Yellowstone Park or the Black Hills. It was sad to say goodbye. Bravo and thank you Howard and Sandi!